Do you want to cut your own french fries or give other vegetables a fancy, wavy or waffle look? Then you need the Adjustable Wave Waffle Slicer. This deluxe model slicer is adjustable for three different thickness settings for the wavy slice, and can also be used to do a single thickness waffle slice. It also features a wide cutting platform with a super sharp stainless steel blade. For a slightly smaller and more affordable slicer with no thickness adjustment, check out the Original Wave Waffle Slicer. This great kitchen gadget from Borner makes it easier than ever to give your vegetables a waffle or wavy ridge cut. You can even make your own crinkle cut french fries by following the simple instructions included with this slicer. Get professional looking results every time with this great tool. Super sharp blades and superior construction make this cutter extremely efficient and easy-to-use. It works great for potatoes, cucumbers, carrots, radishes, zucchini and many more fruits and vegetables. Just slide them across the surface for a quick and precise cut. Slice in a single direction for wavy pieces, or cut and then turn slightly, and cut again to do waffles. You will get perfect, uniform results every time. Use this great tool to add interest to your favorite dishes or make healthy cottage style fries right at home. With three thickness settings you are sure to get the cut you desire. For your safety, you should always use this tool with the safety food holder, which is sold separately or as a set in our combo offered above. High quality materials and superior manufacturing ensure this waffling gadget will last for years of reliable use. Use the Borner Adjustable Wave Waffle Slicer to add that certain edge to your favorite dishes. It creates attractive waffle or wave-cut vegetables for salads, garnish, or frying. 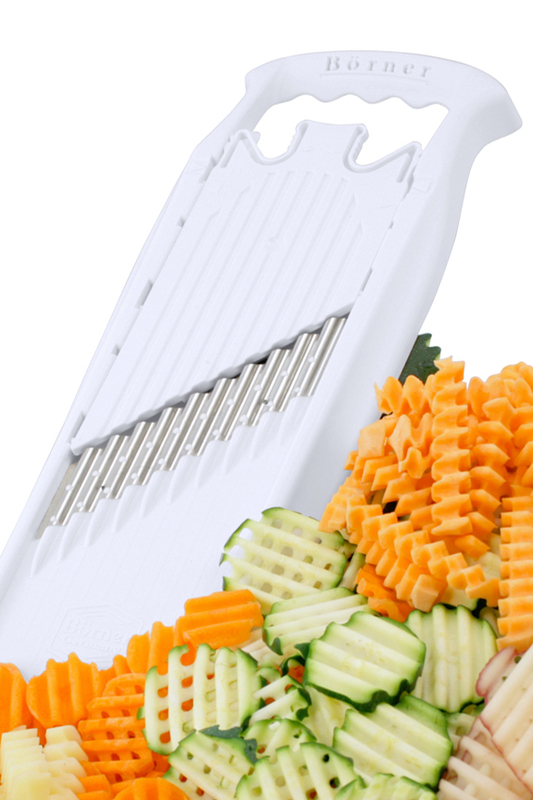 It is ideal for slicing potatoes, carrots, zucchini, beats, etc. The slicer features two control options so you can select your desired thickness and weather you want a wave cut or a waffle cut. The unique notch system allows for quick, easy and accurate selection of your desired cut, so you can quickly set it up, and always be sure it is set correctly. Take out the insert for the thickest wavy slices. Place the insert in the slicer and set to number one or two for thinner slices. In order to get a waffle cut, use the insert and place it at the notch with the waffle picture indicated. The surgical grade stainless steel cutting blades are extremely sharp for high performance slicing of any type of food no matter how hard or soft. With the Borner Adjustable Wave Waffle Slicer the possibilities are endless. It also features finger grips and non-skid feet to make using it even easier. Dishwasher safe. WAVY - This is the most basic option available, and it will result in round slices that have ridges on the top and the bottom. You will have your choice of three thickness options when producing wavy slices from your favorite fruit or vegetable, and the procedure is super simple. Follow the steps below to improve the look of carrots, cucumbers, potatoes and more. Select one of the three thickness settings by squeezing the tab at the top, and then sliding the center insert into your desired position by pulling it away from the blade. For the thinnest slice, choose number 1, for a medium thickness, select number 2, and for the thickest setting, remove the insert altogether. Once your thickness is selected, put your vegetable in the safety food holder by poking it with the metal prongs. To cut, glide the holder in one direction across the entire length of the slicer. You will notice perfectly shaped wavy pieces dropping below. The food holder keeps your fingers safe, and allows you to slice up to the last piece of food. Simply use the plunger at the top to reveal more food as you work until every last bit has been sliced. A safety setting makes storage easy. When finished, slide insert flush with blade, or until the arrow on the frame lines up with the SAFE marking on the insert. WAFFLE - Waffle slicing is a little bit more tricky than wavy, but it's still quite easy to achieve perfect results. When set to make waffle slices, each slice will have ridges on the top and bottom, but also holes all the way through. A slight technique is required to get the desired end result, but after your first attempt, you'll be waffle slicing like a pro. Follow the steps below to make your own restaurant style french fries, or add a unique touch to veggies you cook with. To begin, squeeze the adjustment grip, and set the slicer to number 2. Place your food in the holder by pressing the metal prongs into it. You will want to start at a clockwise 45 degree angle for the first cut. Slide the holder the full length of the slicer to complete the first cut. Next, rotate the holder 90 degrees in the opposite direction, so that you are holding it at a 45 degree angle in the counter clockwise position. Make your next slice like this. You will see your first waffle slice drop below the tool. Continue like this, rotating back and forth between slices to keep cutting waffle after waffle. Once you master it, you will only need seconds to cut up a pile of perfect looking waffle fries that are all the same thickness, so they will cook evenly and taste great. CRINKLE CUT - Quickly create thick sticks that are wavy on all sides, just like the crinkle cut fries you buy from the store. This cut also requires a bit of technique, but it's not difficult once you have some practice. Essentially, you will be doing a wavy cut twice, and the end result will be crinkle cut fries. Use with potatoes and other vegetables, and impress friends and family when you tell them they're homemade. Follow the steps below for perfect results. To begin, set the slicer to the number 2, or remove the thickness insert for the fattest fries. Once the thickness has been selected, secure your potato into the food holder. Glide back and forth to make wavy slices from the whole spud. Once finished, gather all the slices and stack them. Turn the stack on its side, and then place into the food holder again. Glide back and forth again to slice once more, and the end result will be sticks with perfect sizing. Borner of Germany manufactures the finest quality vegetable slicers on the market today and are leading edge in design and technology. Their unique products help add creativity to any gourmet meal. In 1956 Borner manufactured an onion cutter made of a piece of wood with four blades. Today the Borner products have evolved into a must have line of slicers from the V-Slicer Plus to the Combi-Chef and Veg' Art Prep Tool. Borner products help add creativity to any gourmet meal. All Borner products are made in Germany. Dimensions 13.5" x 5" x 1.5"
Adjustable Yes. 3 different thickness settings. Easy Adjustment Yes. A simple "click" system allows you to effortlessly change cuts. Safety Holder Included Purchase with or without holder. More info here: Food Holder - Save money when you buy both items together. High quality materials and craftsmanship make this German made kitchen gadget a must have. A great accessory for anyone that enjoys cooking. Cut your own french fries or give your vegetables waves and ridges. Great for potatoes, cucumbers, radishes and more. Order Yours Today! The Borner Wave Waffle Slicer is simply the best waffle cutter on the planet. Affordable, easy to use, easy to clean, it offers the most convenient cost effective way to produce fresh waffle cut sweet potatoes. I am very pleased with the mandolin slicer I ordered. It is very sharp and easy to use the different thicknesses. I used it for x:mass corrot dish, coriander, fig & union with chardonnay. I have purchased the safety holder, a little pricy, necessary though. Over all very nice. Not a real work horse though. Really sped up cooking. This is my second Borner product, and just as the first, high quality, and does the job to perfection. ...I was blown away. This tool is freaking fabulous! This works exactly like described. Good quality and easy to use, but definitely order the guard (extremely sharp). Would recommend highly. Love it! It made my life easier and more fun to cook. It looks cheap but work like a pro. Great product but would recommend the purchase of the complete system including the food guard and container. My husband loves this product. He has been trying for years to figure out to make waffle cut fries. This product easily makes waffle fries. Would highly recommend! Absolutely the perfect slicer for my need. I couldn't ask for anything better. After using the original for 20 plus years, this new versions is a real disappoint. The adjustable part is flimsy and it stained at first use. If you're using it for something very firm, it works well, but for red pepper, it tears as if the blade is dull. Have the same issue with cucumbers if not totally stiff. Wish I could return it and order the original instead. Sorry, but true. This waffle slicer has worked great since purchasing! I'm so happy to be able to finally have fresh crispy waffle fries! I Love this slicer!! It is so easy to use and it's fun making the waffle shape!! Very easy to clean!! Love these cutters so much that I ordered one for each of my 4 daughters as well as myself! Great addition to the V-Prep Mandoline Slicer (7 Piece Set)! I purchased this as a complement to the V-Prep Mandoline Slicer (7 Piece Set)! I like that is it adjustable so I can get waffle fries and wavy vegetables. If you get the V-Prep Mandoline Slicer (7 Piece Set) - it already comes with the food holder. The Borner Wave Waffle Slicer is simply the best waffle cutter on the planet. Affordable, easy to use, easy to clean, it offers the most convenient cost effective way to produce fresh waffle cut sweet potatoes. Our customers rave about them. Appalachia owns 3 of them just in case!! The Borner Adujustabl Wave Waffle Slicer is everything that I hoped it would be. It is adjustable to two thicknesses so I can make them thick or thin. I slice russet potatoes with it and spread some olive oil, salt, and pepper and pop them in the oven. I would recommend this slicer to anyone. You can't go wrong. I have been trying to make good waffle fries at home and haven't been able to find a waffle slicer that makes the fries thick enough but still leaves an opening in between the ridges. This is the best I have found so far, but it still leaves a lot to be desired. There is no way to adjust the amplitude of the wave, only the thickness of the slices. They are so fun to use! These wave waffle slicers were demonstrated at a garnish show. They are so fun to use on relish trays for cucumber, summer squash, and small zucchini. Many people question, "How did you do that?" It's so simple with the Borner Wave Waffle slicer. Plan to give one to each of my daughters! This slicer makes waffle fries just like the restaurants do. Very inexpensive and good quality! Love it. Have been looking for a waffle slicer for a long time. Works great. I bought two, one for my sister and one for me. this is everything ive expected it to be.this product is well worth the price.the only thing I would've done different was buy he veggie holder to keep distance from the blade.trust me that blade is sharp. It arrived! VERY happy with it. Easy to use, perfect. Had a little delay with shipping by I can see why. I've had 3 so-called waffle slicers, one even by Pampered Chef, but this is the first one that actually can make waffle fries. Thanks for accurate advertising on a product. I wanted this to crinkle cut carrots and potatoes because the Born V-Power I ordered won't do this cut. Other reviewers say it works with potatoes, and I hope it does. I haven't tried potatoes yet, but I cannot get it to work with carrots. The blade seems dull, and it does produce good slices. Also, this slicer is flimsy and bends easily. The choice of thicknesses is not satisfactory: on is too thick and the other is too thin. Maybe I will have better with slicing potatoes. Purchased this for myself about 3 weeks ago. So far it works great and slices huge baking potatoes with ease. Purchased the waffle slicer combo as a gift for my daughter. She loved it so much she sent me mouth-watering pictures of the waffle fries she made for her family. I want to make thick sliced french fry circles, and yes I see this has three thickness settings, but how thick is the thickest slice, hoping for about a half inch to five eights? It comes close to 1/2" at the thickest setting, but not over. Measures somewhere around 3/8-7/16. Does the Borner Adjustable Wave Waffle Slicer have legs or is it hand held? Standard operation is handheld at the back with the front resting on the counter. If you get the bowl, it can be mounted onto that for operation similar to a unit that has legs. Will this slicer work on sweet potato? They are a lot more harder then regular potatoes. Yes it will. The high quality blade makes it easy to slice this notoriously tough vegetable. for the 16.95 does that include the handle with the prongs to hold the item being sliced and not slicing your fingers? No. That price is for the slicer only. Some companies will charge ten dollars or more for the holder separately. We offer a combo as an option when you add the slicer to the cart, so that people who need one, can get the holder for a low price. How thick can the waffle cuts get? At the thickest setting the slices will be about 7/16" at the thickest section. 2 of 4 Customer(s) found this Answer helpful. How thin waffles can the slicer be adjusted to? Is it suitable for making my own potato chips? Exact thickness will vary depending on the pressure applied, but at the thinnest setting, it does slice with a thickness that works well for chips. German Made Slicer With Storage Bowl Included.